Next up in our ‘Berlin snapshots’ series is Apfel Zet, a design studio who pride themselves in their ‘ornamented, eclectic, anti-modern approach’. Julia Bittner, Jarek Sierpinski and Roman Bittner all studied at the Staatlichen Akademie der Bildenden Künste (State Academy of Fine Arts) in Stuttgart. After graduation they began working as independent designers, and went on to found Apfel Zet in the Berlin district of Neukölln. 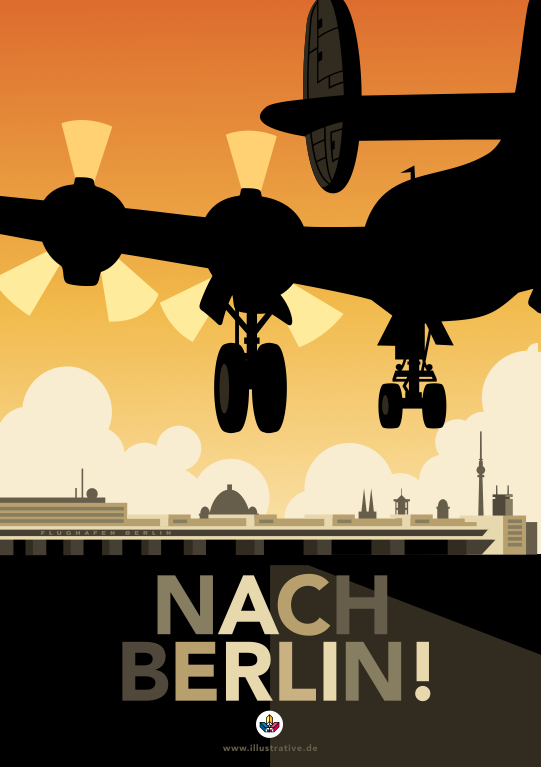 Top: Nach Berlin!, a poster for Illustrative 09. Below: Early Apfel Zet poster for a diploma exhibition and party at the State Academy of Fine Arts Stuttgart, inspired by Ott+Stein posters of the late 1970s and early 80s. Eye: What part has Berlin played in shaping your distinctive style? Apfel Zet: Before beginning his design studies, Roman studied art history and history at Berlin's Free University (FU). During this time, he became interested in the birth and failure of Modernism, which he would later answer by means of Apfel Zet’s ornamented, eclectic, anti-Modern approach. 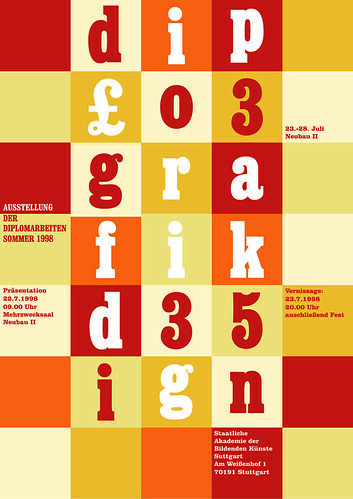 This was the heyday of the Ott+Stein design studio, whose posters appeared prominently in the Berlin cityscape. Their clear, two-dimensional style prompted Roman to study graphic design in the first place. Ott+Stein's overall approach, rooted in the Modernist curriculum of the Ulm design school yet fused with influences from the early twentieth century such as Bernard, Hohlwein and Cassandre, was to leave permanent traces in our work. Eye: What makes you want to carry on working in Berlin? AZ: We love the city – but not particularly for its design scene, in which we're sporadically visible at most. We are very much inspired by the city as a whole: we find new stimuli on our wanderings through the Berlin and Potsdam castles and gardens, in the buildings designed by Schinkel, Stüler, Persius and Behrens, to the Lietzensee and Messedamm, the AEG-Areal-Voltastrasse (which can all be seen in our fictitious city, ‘Zarovka’). In the studio we have discussions about the City Castle, the New Museum and the new projects by Kleihues, Chipperfield, Kahlfeld and Kollhoff. Above: A detail of ‘Train Station and Sky Harbour’, for Illustrative 07. 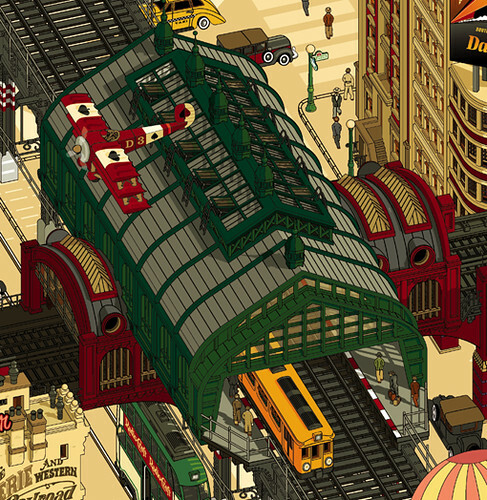 This depicts an overhead subway-station, combining the Hackescher Markt and Eberswalder Strasse stations with an typical Berlin subway. 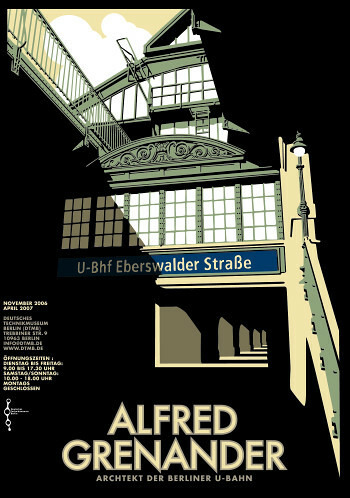 Below: Poster for the Deutsches Technikmuseum Berlin, advertising an exhibition about Alfred Grenander, one of the most prominent architects of the Berlin subway. Eye: You say you aren’t particularly visible in Berlin’s design scene, but are you influenced by it? AZ: For Julia, the Cyan design studio is an important influence. In the same way that Roman became aware of Ott+Stein as a graphic design studio, Julie first discovered Cyan through the annual ‘100 best posters’ exhibition. Jarek is a great fan of the graphic artist Mawil, and regularly attends meetings of the Berlin comic scene in the Renate bookshop. 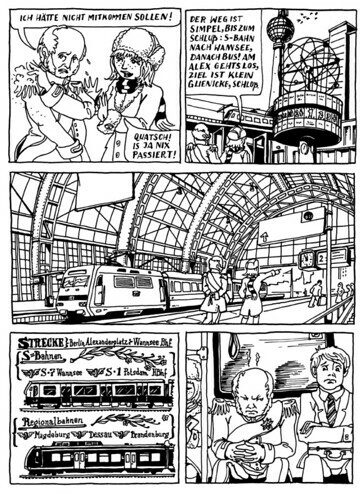 He has drawn a comic strip devoted to Berlin, whose main character is the Prussian king, Friedrich Wilhelm IV; with Roman he shares a special predilection for that king's architects and for the romantic era in which he ruled. Below: Apfel Zet’s comic about Friedrich Wilhelm IV. Eye is available from all good design bookshops and online at the Eye shop, where you can buy single issues. Take out a subscription, and get Eye delivered to your door, anywhere in the world.